Not that I don’t adore my friends who don’t cook. In fact, now that I think about it friends who DON’T cook can be much less judgmental when I’m serving up something hot out of the gluten-free oven. But that’s not what I’m talking about today! It is Day 2 of the giving away of The Gluten-Free Cheat Sheet: Go G-Free in 30 Days or Less. Hooray! But first, let’s see who won yesterday’s challenge. The question: Who you were not able to share GIMB with, but would be so stoked to share my new book with tons of recipes and zero foul language? The winning answer was a close call as I read about many mother-in-laws, piano teachers and tuxedo g-strings. Also, kids. Since I have a 6-year-old who chastises me by saying, “Why did you WRITE that, Mommy?? ?” I get it. But the winner of the Day 1 giveaway had to go to the preacher’s wife. “I have a sweet and innocent friend who would blush a thousand times over at the mention of your first cookbook. In fact, she did!! I know she would love the additional GF recipes, but could never place it on a bookshelf. Not only does she have young children, but her husband is the preacher! Sarah, your sweet friend with gluten issues is about to receive a very safe book. Email me at aprilhatesgluten@gmail.com and tell me where to send it! Congrats. And now for today’s question! When I sat down to write The Gluten-Free Cheat Sheet, I realized that 100 recipes was a lot to handle. For anyone who is interested in the cookbook writing process, standard practice means testing each recipe at least 3 times to make sure it works. So we’re actually talking 300 times making these things. Holy quinoa. While I did grab old favorites—in fact, most of these recipes are meals you’ll find on my table on any given day—I decided it was time to call in the big guns when my stirring hand started to cramp. Maura Wall Hernandez is my fantastic recipe developer, who also happens to be an amazing food blogger and editor. I worked with Maura at Mom.me and when she saw me unloading my recipe failures on the office, stepped in to help me to the recipe finish line. God bless her. 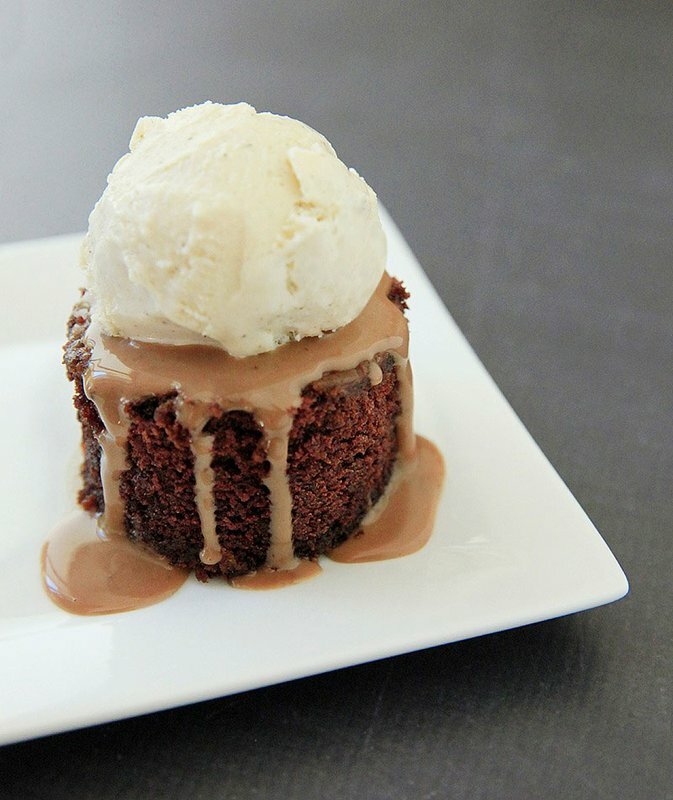 In fact, that’s her food styling efforts right up there on my Bourbon Joe Cake. The ice cream was her idea, natch. Maura is responsible for the Pumpkin Pound Cake, the World’s Greatest Granola, the Poutine and more. She rocked it, and she deserves a rousing cheer. She is also the subject of today’s question: What is the name of Maura’s award-winning blog, and what recipe from her blog do you want to make tonight? Answer in comments and on FB and I’ll pick a winner tomorrow morning! And I LOVE Mexican food so it’s hard to pick… But baked taquitos sound amazing right now! Theothersideofthetortilla.com ; Roasted jalepeno hummus or guacahummus! Yum! The Other Side of the Tortilla. (okay, I want someone to make it for me). Me too, Joel. Me, too. The Baked Taquitos look yummy! Just need to substitute with gf tortillas or maybe corn…. Suggestions? If you’re patient, this tortilla recipe is so good, you will want to eat them plain! Even tastier if you use warm milk instead of water. Maura has the fabulous blog, “The Other Side of the Tortilla” and her Salsa Verde Cruda is versatile and so yummy! It always reminds me of a dear friend we met when my husband and I were first married. She was a friend who cooked, and she was a lifesaver to this newly married cowgirl who could burn water. Now I just need me some tomatillos! Her blog is called The Other Side of the Tortilla! Love it. It was one of the first latin food blogs I ever read and was a big inspiration when my mother and I decided to start our Peruvian food blog, Peru Delights. I would love to try her amaranth and chocolate bars. Yay for The Other Side of the Tortilla! I can’t get to visit my friends in the Andes (in Peru) this summer, and I’m missing them so much. So, I loved checking out all the recipes, and reading the parts that were in Spanish, too. ¡Mil gracias! I’m going to make the Roasted Jalapeño Hummus! Dipping in tortilla strips……..mmmmmm………with a cold salad with cukes and fresh lettuce. Thank you! I’m so glad to have found her site. Yay. The Other Side of the Tortilla is the name of her blog. I want to try the baked taquitos, they look so yummy! !